Project Learning Tree has recently awarded 20 GreenWorks! grants to schools and organizations across the country for environmental service-learning projects. Nearly 5,000 students in 16 states will “learn by doing” through a variety of projects they help design and implement to conserve and improve the environment. By working together with their peers and community members, young people are learning to become good environmental citizens and to lead by example. GreenWorks! projects also provide students with opportunities to apply STEM (science, technology, engineering, math) to solve real-world challenges. Students learn that they can make a difference in the world and that they are part of the solution for creating a sustainable society. Since 1992, PLT has distributed more than $1 million to fund more than 1,000 PLT GreenWorks! action projects in communities across the country. The GreenWorks! 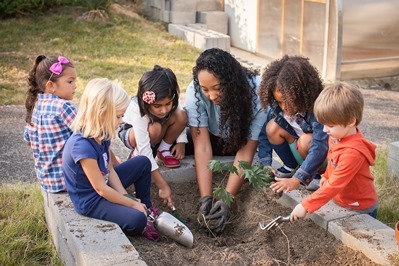 grants awarded this year, thanks in part to some funding from the U.S. Forest Service, will enable preschool through high school students to plant trees, restore native habitats, create school gardens and outdoor classrooms, conserve rainwater and mitigate storm water. In Columbia, SC, 7th grade students will build rain gardens on Dent Middle School’s campus to mitigate storm water. They proposed the idea in response to a flood that ravaged the area in October 2015. In Pukalani, HI, students at King Kekaulike High School will remove invasive species and restore a dryland forest site in the mountains of Maui. In Asheville, NC, Glen Arden Elementary students will learn about the importance of pollinators for our food, economy, and healthy ecosystems. They will put their knowledge into practice and support pollinators by creating pollinator gardens on their school campus. Learn about all 20 funded projects. The deadline to apply for a GreenWorks! grant is September 30. Application forms will be made available in the spring from www.plt.org/resources/greenworks-grants. There is historic new federal funding available for environmental education through the Every Student Succeeds Act (ESSA). Invite your school superintendent to learn how to apply for this funding and why. Our new series of free webinars will provide teachers, administrators, and students valuable information and ideas on how to implement PLT’s GreenSchools Investigations.